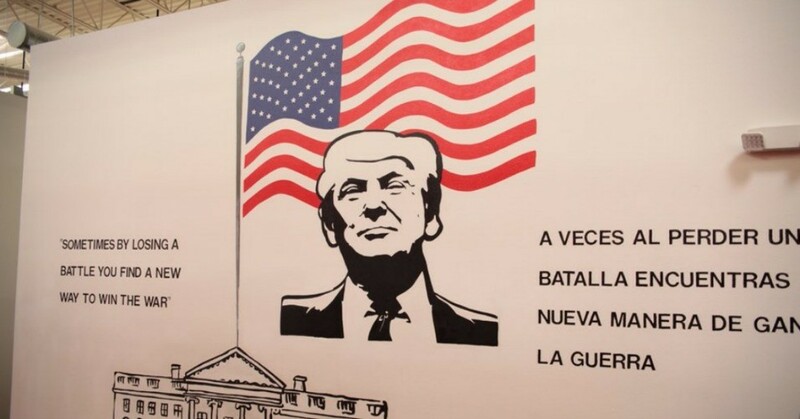 One of the images in the Casa Padre shelter in Brownsville, Texas, is a large mural of President Donald Trump with a quote (rendered in both English and Spanish) from his 1987 book The Art of the Deal. “Sometimes by losing a battle you find a new way to win the war,” it reads. But if the mural slogan feels like an updated version of “Arbeit macht frei” – it’s because it is (obviously Godwin’s Law is suspended for this and other articles about the American camps). Trump’s face shines down benignly in front of gently rippling red stripes, his hair more John Kennedy than Steve Bannon, a simple wholesome expression on his handsome face. 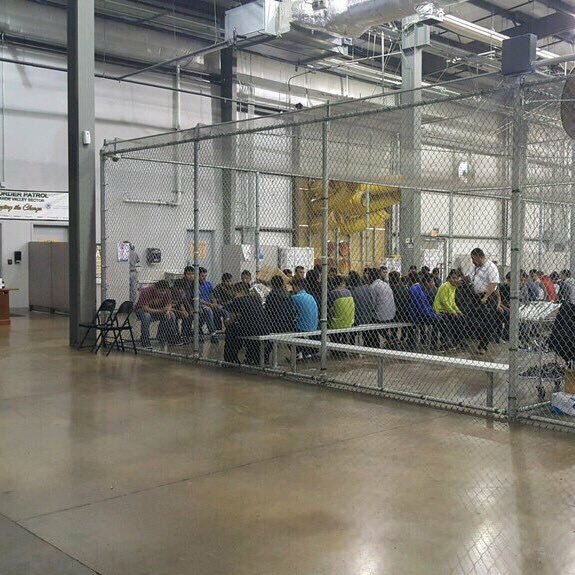 It’s a nice print with echoes of the Obama ‘Hope’ series designed by Shepard Fairey, except they are in a ‘shelter’ with children in cages so some of the sort of ‘hope’ vibe is a little lost. The fact that one of these ‘shelters’ is an abandoned Walmart just adds to the feeling that this is some new dystopian Netflix drama. But it’s not. We maybe shouldn’t have been so surprised that a country that was okay with Guantanamo and Extraordinary Rendition should start caging children, but we are. Watching the Trump people defend and articulate this obscenity is remarkable and deeply unsettling. The best part of that sequence is when he says: “It’s the Law”. But what’s being done here is using this phenomenon as a way to ratchet up the political pressure to get Trumps wall built and more draconian immigration policy enacted. The Trump pushback is also extraordinary. While some administrations might be shamed into a change of tack, the Trump Republicans are unabashed, quite happy to defend the practice. This is where we are, back at Arendt’s banality of evil, back with Holes of Oblivion. A couple of other points are worth noticing. There is absolute zero rebellion from the Republicans to any of this. According to Mike Jollett: “the Percentage of party members who back the bill to END child separation was as follows: Democrat: 98% Republican: 0%.” So any thought of discerning between ‘Trumpists’ and ‘Republicans’ has been extinguished with this absolute collusion. This is true, though when and how this “will be over” amid denial, moral apathy and terrifying levels of God Bothering and vile talk of “Orderly and lawful processes” I’m not quite sure. And here you have Ann Coulter calling the children ‘child actors’. Now where have you heard that phrase before? This is a terrible moment in American history. What happens in America comes to us in due course. Spurred on by the tabloid press, we have seen it with the demonization of “Migrants” by the merging parties of UKIP and Tories. How many refugees were accepted from Syria to live in England? The majority came here to Scotland where they are, in the main, welcomed. Within the M25 here and now it is becoming a zone where only those with property which equates to wealth are allowed to live. The poor without anywhere to live are given bus tickets and sent elsewhere. There are many ghettos for the poor in London, like Grenfell tower, that are neglected and allowed to fall into disrepair. When they become uninhabitable the people are evicted (or burned out) and the site becomes available to demolish and build more rich men’s houses. This horror story is not confined to London. Our Home Office is combing through everyone’s records and if any excuse can be found a deportation order is speedily arranged. There have been several instances where perfectly legitimate people that have lived here in Scotland for years are rounded up and deported. Sometimes there is an outcry and sometimes they are allowed to stay but the pressure is on. It’s OK if you are rich or donate to the Tories but if you are poor and do not have a passport that says British Citizen then you are a target for Dungarvel and deportation. If you have a passport from somewhere else do not go abroad on holiday as you may find it extremely difficult to get home. plus all the various legal challenges and rulings to check and challenge practice. Laws can also be inherently flawed, unclear or self-contradictory; which can be handled by procedures like judicial review. And perhaps most people reserve the right to disobey an unethical/unjust law. While the article is surely right to point out the objections that this practice reflects policy rather than law, successive USAmerican administrations have had a fairly shaky record on adherence to the rule of law which also deserves to be challenged, and a tendency of non-observance of international treaties (still violating on chemical weapons and so on) or non-implementation (rights of the child and others) which have harmful real-life consequences. “give Trump a chance” Any updates on the Harry Windsor quote? If, as seems likely, the parents are charged, tried and sent to jail, for God knows how long, what happens to the children while the parents serve their sentences? Foster care, adoption, returned to country of origin, and if that what happens to them in their home countries? Will the parents and children ever be re-united? This is a truly appalling situation and Trump and his cronies seem to be making it up as they go along without any thought whatsoever for the welfare of the children or anyone else. On BBC Worldservice yesterday, I heard an interview with someone who took one of the most disturbing photos – of a small girl weeping as her mother was apprehended – during this particular episode of US madness. The photographer has been documenting people’s movements from Central America to the US for the past 10-15 years, and said that the kind of people he is seeing trying to come over the border now are very different from the groups of adult men and women who previously arrived, who were mostly migrants, seeking jobs in order to send money home to their families. Now it’s whole families, fleeing in terror from violence and bloodshed. The interview didn’t give the reason for this violence, but surely the major factor is the production and distribution of illegal drugs, especially cocaine, and the violence that ensues when cartels go to war to control the trade – a trade that is generated and fuelled by demand from, yes, US citizens. The US OWNS this disaster – so among other users, every coke-snorting Trump-voting stockbroker OWNS this mess. I agree with your analysis, Greenergood. Drug wars have for decades destabilised much of Latin America. Although I abhor drug abuse, repressive drug policies in the US are damaging countless bystanders and preventing a whole region from peaceful development. A more enlightened attitude to the problem would have taken away the need of most families to show up in the first place. Accordingly, US drug policies have to be rethought. And there is a lot of money to be saved by being less ideological.